ENTERTAINMENT PACKAGE #4 -inc:AM/FM stereo, Advanced Bose 10-speaker 5.1 Surround Sound DVD entertainment system and navigation system with backup camera, Radio Data System (RDS), speed-compensated volume and TheftLock and auxiliary audio jack which enables plug/play connection of all auxiliary audio players. DVD entertainment system includes 8" screen, rear audio controls with 2 headphone jacks and 2 wireless headphones. 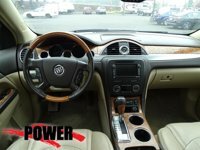 Find a great sale price on this 2008 Buick Enclave AWD 4dr CXL at Power Honda in Albany Oregon. This 2008 Buick Enclave is located at our Honda dealership in Albany. We also serve the cities of Salem, corvallis, and Lebanon. So if you're looking for a great price on this 2008 Buick Enclave AWD 4dr CXL or just looking to get an auto loan for the vehicle you want... you've come to the right place! Power Honda.